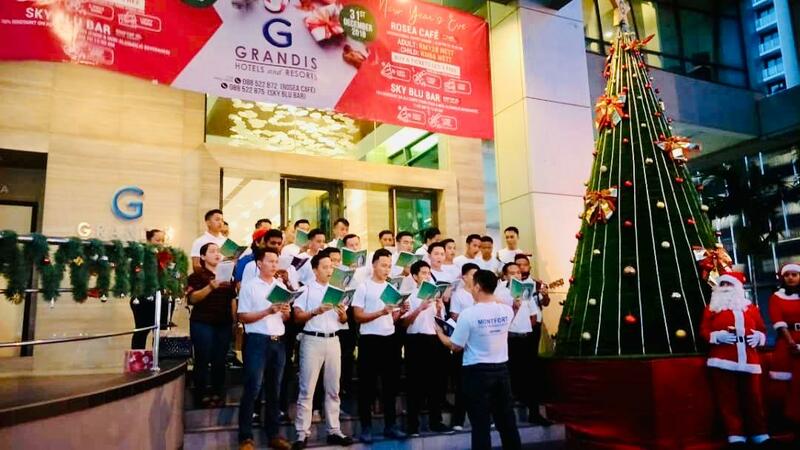 Kota Kinabalu : Hotel Grandis ushers in the festive season with a calendar of delicious dining and funfilled entertaiment throught christmas and the New Year to celebrate the most joyous time of the year. As a special highlight of the season, The Hotel's Christmas Tree Lighting Ceremony welcomed the public on 12 December 2018 where the hotel is dressed to impress with holiday decors. The Ceremony was held in front of the hotel entrance where by-standers were able to enjoy the beauty of the 15-foot tall Christmas tree. Plenty of bright LED string lights were strung vertically on the Christmas tree, adding to the air of festivity. The hotel celebrates the festive season with bountiful Christmas offerings. Patrons are welcomed to dine in with loved ones in the family-friendly setting of Roses Cafe at RM108 nett per pax during Christmas Eve and day; buy 6 tickets and get 1 ticket free. Other offerings includes 6kg Roasted Turkey with traditional trimmings at RM488 nett per order, a 2kg roasted lamb leg with sides at RM338 nett per order. Interested individuals are encouraged to book their order at 088-522872 (Roses Cafe). Christmas cookies and gingerbread houses are also available for purchase at the Piano Lounge, up until the 23rd of December 2018, from 12pm to 8.00 PM daily. The Piano Lounge is located on the hotel's first floor. The Grandis Hotel also like to urge the patrons to come to the fully decorated Roses Cafe to enjoy a wide array of local specialities as well as a delightful variety of holiday classics in New Year's Eve at RM128 nett per pax. For more information or to make a reservation, please contact Roses Cafe at 088-522 872.